Not only did NASA purposely crash a Marine helicopter today, but they also stuffed 15 crash test dummies inside for a group “crash” party and filmed the event from every angle imaginable. The crash test took place at the Langley Research Center in Hampton, Virginia and engineers dropped an old Marine CH-46E helicopter fuselage from a height of about 9 meters (30 feet), traveling at about 48 km/h (30 mph) to test improved seats and seatbelts and gather data on the odds of surviving a helicopter crash. The fuselage hit hard, as evidenced by the video and images NASA has released. Thirteen instrumented crash-test dummies and two un-instrumented manikins had a rough ride, as did some of the 40 cameras mounted inside and outside the fuselage. Preliminary observations indicate good data collection, which will take months to analyze. 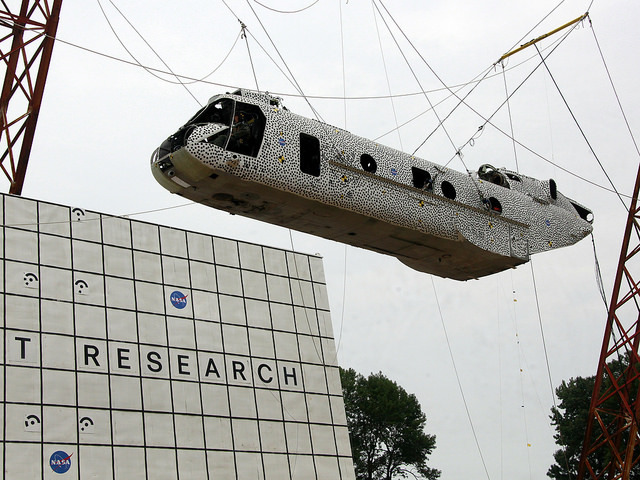 The CH-46E helicopter fuselage ready for its crash test. Credit: NASA/Langely Research Center. Researchers used the cameras as well as onboard computers, which data from 350 instrumentation points, to record every move of the 10,300-pound aircraft and its contents. The helicopter’s unusual black-and-white-speckled paint job — a photographic technique called full field photogrammetry — also aided in the data collection effort. “High speed cameras filming at 500 images per second tracked each black dot, so after everything is over, we can plot exactly how the fuselage reacted structurally throughout the test,” said NASA test engineer Justin Littell. NASA will use the results of both tests in efforts to improve helicopter performance, efficiency and safety. Researchers also want to increase industry knowledge and create more complete computer models that can be used to design better and safer helicopters. You can see more images and video at the Langely Research Center’s Flickr page.